When I decided to take a video tour of the amazingly talented Michael Quinn's Carroll Garden's apartment, I should have realized that everything I wanted to share with you wouldn't fit in just one blog post, let alone a short video. So as soon as I started photographing and video taping this decorating and entertaining visionary who shares my fascination for vintage and thrift, I quickly realized that even a week dedicated to Michael's many talents (Add Bollywood dancer to the list! ), would leave the topic short shifted. Here's the first part of "Quinn-Essential," a video tour of Michael Quinn's awe-inspiring home. Come back tomorrow for part two! One of the best things about a party created by Michael Quinn is the way he re-uses everything he owns to create an unforgettable tabletop. In this photograph by Jim Franco for The Find: The Housing Works Book of Decorating With Thrift Shop Treasures, Flea Market Objects, And Vintage Details, Michael, along with festivity visionary Heather Kerr, modeled a welcoming bar scenario with of an abacus lamp, an anatomy class brain and an owl that was once used as part of a display in the windows of Henri Bendel. Come visit me tomorrow as we take the first part of a video tour of Michael's unforgettable Carroll Cardens apartment. It's Quinn-Essential week here at The Elegant Thrifter! I recently visited with Michael Quinn, a visual expert, a fashion merchandiser, a fabulous party host and a Bollywood dancer (oh yes, you heard me right) with the intention of guiding a video tour through his pad in Carroll Gardens, Brooklyn. However, once I arrived in Michael's space, I was reminded of how easy is is for the eye to wander while taking in every detail of Michael's mesmerizing masterpiece. As we started taping and photographing, I found myself examining every item that Michael has so lovingly placed -- from gigantic, Mexican flowers hanging in the kitchen to a mini mantle used in Tiffany & Co. window display-- that it soon became clear that it wouldn't be possible to edit everything down to one blog post. So for that reason I'm dedicating this entire week to the visual vastness and variety of Michael Quinn's whimsical home, the same one featured earlier this month on Design*Sponge. 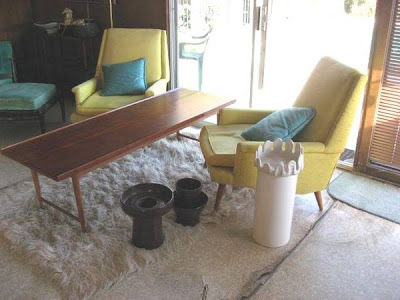 As you may remember, Michael and his pal Heather Kerr are the creative geniuses behind the retro-iffic vintage tailgate party that's featured in The Find: The Housing Works Book of Decorating With Thrift Shop Treasures, Flea Market Objects, and Vintage Details. And, why, there's a copy of The Find right there, underneath the biology class brain and behind a couple of ghoulish skulls. I am honored by its distinguished placement! The Gift of Thrift: What's in a Name? What happens to you when you do a Google search for your name? When I type "Stan Williams," into the search box, quite often I am presented with the findings of a researcher from Hewlett-Packard, a thug who allegedly was also a gang leader, and this man who played for the Los Angeles Dodgers from 1958 to 1962. Just the other day I re-discovered a prized vintage treasure that I used to keep on the wall of my office when I worked in fashion. Sent to me by garage sale guru Ruth Handel, this souvenir mini-poster, distributed by the Union Oil Co. of California, was painted in 1962 by a certain Nicholas Volpe, "one of America's most distinguished portrait painters," who also was known for his renderings of Academy Award winners. I admit that I like sharing my name with this handsome Stan Williams. Not only was Stan a Major League Baseball player, but at the time this poster was distributed, he was a sporty type towering at a stately six foot and four inches! And he apparently was better known as "Big Daddy." 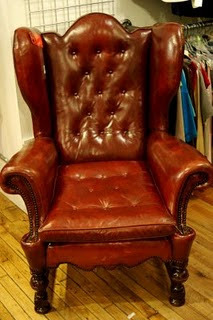 There is something quite irresistible about a wingback chair, having lovingly ogled a few in my day. Even though I'm quite an admirer, I have yet to add one of these iconic examples of seating to my apartment, mostly because I don't yet have room for yet another acquisition. But that doesn't keep me from reveling in the inspired work that others have achieved by taking something as blah as this leather number I photographed at Housing Works on Crosby Street in New York and creating a focal point of fabulosity like the one pictured below. This terrific twin set was created by my friend Cheryl Maeder Antonio, an ultra-talented artist and photographer who also runs the West Palm Beach-based design firm, Gardenhouse Decor. 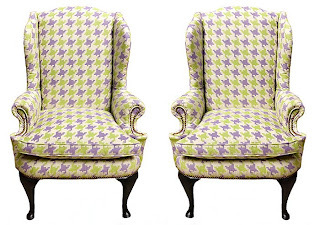 I admire how she softened what might be considered a masculine shape with a men's wear-inspired hounds tooth print that's lightened up by hues of lavender and pale green. Now that's what I call divine inspiration! Do you ever run into something so delightfully odd that you're rendered speechless? 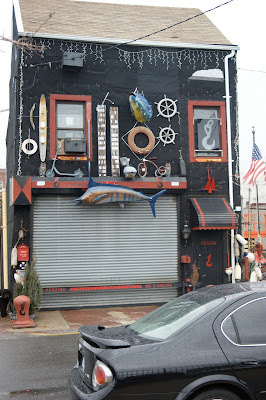 That's how I feel about this house out in Red Hook Brooklyn. Clearly, the exterior decorator has a penchant for marine motifs, decorative fish, scooters and tricycles, but beyond that, I don't know what else to say. And that's coming from someone you know has not only the "Gift of Thrift," but also the "Gift of Gab!" Last night, Derek Warburton of Derek Loves Shopping hosted a sparkling evening to open Housing Works' newest shop located right in the middle of New York's Hell's Kitchen. As you may know, Housing Works is one of the most visited thrift shops in the country, where all proceeds from all sales go to help eradicate the double crisis of homelessness and HIV/AIDS. This spectacular benefit chain was also the inspiration for my book The Find: The Housing Works Book of Decorating With Thrift Shop Treasures, Flea Market Objects, and Vintage Details. If you ever find yourself, you'll want to head right to a Housing Works to satisfy your thrift shopping bug, but for the meantime, check out the good shopping online at www.shophousingworks.com. How can your day not be brightened by a massive pink bundt cake? I know mine was as I was leaving the Brooklyn Flea market last weekend, passed by Willoughby Windows and had to jump out of the car to take a photo of this gigantic, cheery confection. This oversized retro baked good reminded me of all those special treats Mom makes using her own trusty bundt pan. One of my favorites is a cinnamon apple bundt that she likes to whip up for special occasions, especially if there are guests visiting from out of town. How can you not burst out in laughter at the mention of the infamous and mysterious Tunnel of Fudge cake with its surprising gooey layer hidden among the chocolate cake? I know that for me, it's impossible! We even keep a bundt pan out on The Luxor, the boat that we keep out on Long Island. It's been used well to make monkey bread, a dish that's concocted out of canned biscuits dipped in butter and rolled in cinnamon and sugar. I have to say, there's something about a bundt pan that makes any cake a little more special -- even if it's whipped up out of a box. If that weren't enough to get your taste buds tingling, you can make this decadent delight even more irresistible by taking the time to drizzle it! If you've ever meandered about New York City, you know what a welcoming sight one of the city's small parks or squares can be when you just need a moment or two to catch your breath or rest your feet. Since most Manhattanites are apartment dwellers with no access to outdoor space, these little urban oases, no matter how small, act as a back yard, a front porch or a sunny terrace when the weather is warm and pleasant. This little outdoor area in lower Manhattan, Petrosino Square, just went through a renovation where salvaged architectural details are cleverly placed on new brick columns that delineate the entrances to this space. I can see myself lounging on one of Petrosino Square's park benches on a bright, Spring day. Do you think I can pick up WiFi there? The most wonderful thing about the winter version of The Brooklyn Flea is that it takes place indoors at the fabulous old Williamsburg Savings Bank in Fort Greene. One of the best features of this market, which only runs on weekends until March 28 and then moves outdoors, is that it make use of all the structure's unique architectural details, such as the teller windows and a basement vault, which has been turned into a food court, or the flea market kind. People always ask me about what I buy at thrift stores, flea markets and garage sales, but the response may surprise you. I actually buy very little. 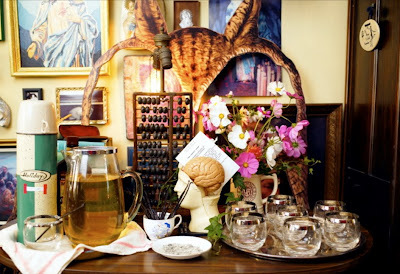 Of course, I'm drawn to old postcards, well traveled ephemera, vintage cook books, silly sewing notions and Dolly Parton memorabilia, but if I bought everything that spoke to me I would have a starring role on Hoarders. You see, there are several reasons why I don't always buy, mainly being that I live in a one-bedroom apartment in the middle of Manhattan where I write my blog in the corner of my living room and do my projects sprawled out on the floor in front of my sofa. But the other reason is that for me, it's more about the journey of a discovery than the acquisition. It's sort of like people who decide to decorate their homes all at once and fast and furiously as they can, and then when the creative fun is complete, they're bored and are ready to do it all over again. (Or buy a new house!) But when I do make a purchase I do it from the heart without having too much research on hand about what I'm looking at or exactly how I'm going to put my new acquisition to use. Take for instance a pair of Homer Laughlin salad plates I talk about in The Find: The Housing Works Book of Decorating With Thrift Shop Treasures, Flea market Objects, and Vintage Details. As I was doing research and taking photographs of Sharleen Reeder's work at her lovely shop, Luticia Clementine's in Independence, Mo., I spied a pair of Homer Laughlin plates with romantic characters in silhouette on sale for a few dollars. My heart spoke strongly, so I bought them. As Sharleen wrapped up these lovelies in her signature polka-dotted bags, she paused as she passed me my change: "I'm so happy you bought these," she said. "I can tell you love them just as much as I do." And I did. But once I got them home, I couldn't quite figure out what to do with these pretty possessions I had flown half way across the United States -- until my pal Bevy Smith's birthday arrived that year. I wrapped them up in pretty paper and presented my finds to her on her special day, knowing that the treasure that spoke my name while shopping in my home town was headed to a warm and welcoming Harlem home. As the weather starts to warm, it's images like this that start to come to mind, triggering the urge to throw off the sweaters and coats in anticipation of longer days and a sunnier disposition. Until last year when I went to the Round Top market in Texas with my pal LeAnn Stephenson, The Vintage Laundress, I had never seen such a gathering of metal porch furniture as this one just hanging out in a field along the highway. The collection was phenomenal: shell rockers for as far as the eye could see and gliders of every shape and size. Isn't it funny how objects, like these once-discarded pieces of metal furniture, can instantly tap into our memory banks? These reminded me of my Grandma Churchill's front porch, which was the summertime living room where her metal lounger was the perfect spot eat drippy watermelon, watch Fourth-of-July fireworks displays, churn homemade ice cream or just lounge about on a lazy summer day. 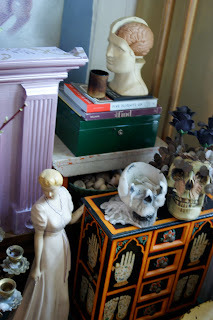 Saturday Surprises: Call me the Thrift Tipster! I'm hoping my LA Times pal David Keeps' alarm clock goes off in time today for him to zip out to this estate sale I tipped him off to in West Covina, California. Read about it here. I found this little metal heart topped with a beaded, floral pin lying on the street next to a pile of snow that was slowly thawing. Maybe Spring really is on the way. Heartfelt wishes for a wonderful weekend. I recently headed out to Jackson Heights, Queens to stop in on my pals Robert and Fabian who've worked wonders on discarded objects and turned them into provocative home accessories. 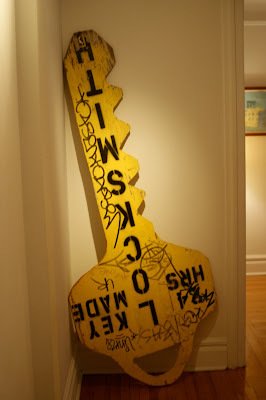 This gigantic key was found lying on the street in the East Village. They tossed the old locksmith sign into their car, carted it back home and leaned it in the entry area of their apartment. Here's literally a piece of trash that was transformed into a geometric objet d'art trouvé. We found this cut-up slab of metal together protruding from a dumpster of a construction site was right next to their Miami apartment. Look at the image closely and you'll note a bit of the metal track from an amazing, custom-made metal shelving unit that was salvaged from a clothing shop on South Beach. 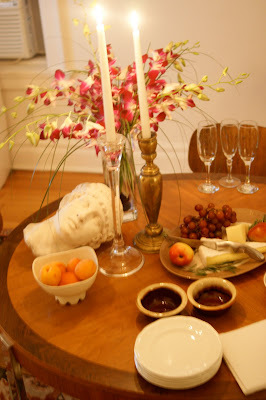 And finally, the head from a Roman bust adds intrigue to an already appealing table setting. He looks completely at ease among the elegantly mismatched candlesticks and casual sprays of pink and white orchids. Sometimes it takes nothing more than choosing a nearby destination, hopping on the subway and simply wandering the streets of a less familiar neighborhood to re-charge my creative energy. Last weekend, we packed up the Flip Video and my trusty camera and headed off to Carroll Gardens -- Smith and Court Streets specifically -- in search of vintage inspirations, like this whimsical window at Retrospect on Smith. You couldn't have asked for better window-shopping weather, with the temptation of spring hanging delicately in the air. And as you know, the very best thing about window shopping is that it doesn't cost you one cent! Of all the hundreds of images from The Find: The Housing Works Book of Decorating With Thrift Shop Treasures, Flea Market Objects, and Vintage Details this photograph by Bob Greenspan certainly rates as one of the most popular. Associated Press reporter Susan Zevon liked it so much that she used it among the images she selected for a story about getting ready for spring, which has run in daily newspapers across the country. Read the full story here. I, too, like this photograph for many reasons, but mostly because it demonstrates how Kansas City's David Jimenez took an everyday thrift store finds, such as discarded wingback chairs, and refashioned them into spectacular pieces of outdoor furniture. 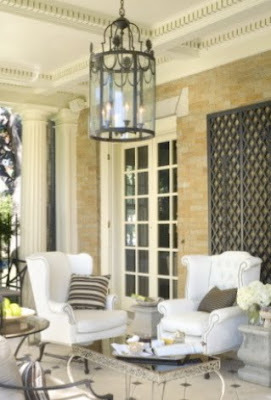 Sitting regally underneath the roof of Jimenez's grand portico, these chairs are covered with white vinyl that's both chic and whimsical, while resistant to moisture and dirt. Mirrors are magical objects. They can reflect beauty from across the room, happiness in a person's face or add light to a dark and gloomy corner. Since the only images they are capable of projecting are what we put into them, mirrors should be placed with care. For even when arranged with all the best intentions, they can easily cast a vision that's full of clutter or that's unpleasant to embrace. I am always inspired by the photo I took of this mirror in the hallway of my Croatian friend Marino Krstačić-Furić. Despite the fact that this mirror is cracked, which for some could represent the arrival of bad fortune, this one, instead, is transformed into a canvas of opportunity displaying hope and joy. Marino drew attention away from the mirror's cracked corner by covering it with a duo of framed prints: one of peppy, colorful exclamation points and another of a dark forest. And when you study the reflection further, you take away a bit of Marino’s hopeful attitude. At the top of the picture of Marino's looking glass, you'll notice a tried and true symbol of luck leaning against the floor molding -- a rusty old horse shoe! Sometimes we choose to ignore what the mirror is capable of telling us and become distracted by what we view as ugly or hideous. Beyond that cracked image is there a patina of beauty? A twinkle of hope? Look closely. It might be right in front of you. She started out as Ingrid, a beaded dazzler packed with chewing gum cigarettes, a ton of funny money and a nip of port. Oh, and hidden in there is also a red licorice pipe. Hey, I don't ask 'em what they're smoking. It's none of my bees wax. But MM decided to keep Ingrid for herself. I told MM, however, that I had an innocent pretty by the name of Claire who hadn't been hooched up. I sent sent her the picture above, saying that I could tart her up to make her look like Marilyn. If you've got a grand piano that not even the best piano tuner could bring back to pitch, why not use it as an imaginative storage space like the window wizards at Fifth Avenue's Henri Bendel did. Now if you're like me, you probably can 't spare the space for a grand piano like this one, let alone a Mini-Moog or an electric organ. Ok, if I'm absolutely straight up with you, I do know someone in a studio apartment in Brooklyn who owns a working electric organ, and he happens to be featured on Design*Sponge right here. You might recognize Michael Quinn's imaginative home from The Find: The Housing Works Book of Decorating With Thrift Shop Treasures, Flea Market Objects, and Vintage Details. This old music maker now plays a new tune to baubles and beads parading proudly inside. I imagine that once the insides were removed, compartments were placed inside for organization, and then it was given a clean coat of white paint for a new life as a melodious storage cabinet. Now that's music to my ears! If you invite me to your house, you can practically be assured that I'll have a pineapple upside-down cake in tow. A retro-riffic delicacy dripping with caramel and cheerily topped with bright, maraschino cherries. Back in September when I made cakes for Senor and Jonona Amor's wedding, I chose heart-shaped pans to make my pineapple delights. The video I'm sharing with you today is one I made in Los Angeles baking in Ruth Handel's amazing kitchen. As you can see, I still had my 'stache and am wearing my baking attire: cut-off jeans and a cobra T-shirt. I've said it time and again, and it's absolutely true: people can't tell the difference between the cake I make that comes from a box and the one that make from scratch. I promise that the cakes you're looking at here were made from my favorite recipe that contains ground almonds. It's just that I left out all the mixing and measuring details to get right to the reveal. 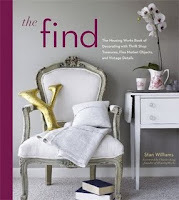 The talented folks over at Flea Market Style magazine have called me one of their Design Sleuth's in their Summer 2010 issue. And apparently, the issue is so hot that I couldn't even find a copy in New York City! But thanks to the friendly staff there, I received not one, but two copies in the mail -- one of which I'll be giving away once I devise a brain-splitting contest sure to keep you hovering for a few days. In the meantime, I still haven't touched my hideous bathroom that I mentioned in the Q&A with FMS, even though I have finally taken the before photos. Aside from this Q&A, which also includes Eddie Ross and Mary Engelbreit, among the highlights in this issue are a visit with the super-talented guys over at Barn House Marketplace; a fabulous photo essay of the flea market in Canton, Texas; and a retro-riffric party room decorated like a 1950s soda shop. The magazine is packed with great ideas from beginning to end, so keep your eyes peeled for it at the newsstand. You'll be glad that you did! At first, I didn't understand what the smelly, crusty guy at the Round Top market in Texas was saying to me after I dug this mushroom platter out from underneath a pile of dirty, chipped plates and a plastic salad spinner. 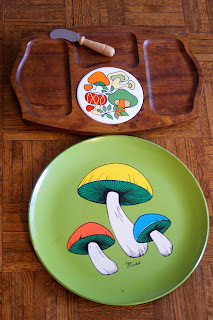 All I wanted to know was how much he wanted for this green, round tray decorated with three colorful mushrooms. "He is asking you if you have mushrooms, you know 'shrooms -- hallucinogens," prodded my flea-market-partner-in-crime LeAnn Stephenson, better know in Blogland as The Vintage Laundress. I was so deep in thought about how I had to have that disc of avocado goodness to complement a teak cheese tray I still have after all these years that his mumblings made absolutely no sense to me. My first memory of this wooden, made-in-Japan tray, which still lives in its cardboard, JC Penney box, is from a Thanksgiving day in the mid-'70s. My parents had just bought a got a color TV console, and my sister and I couldn't wait to see the Macy's Thanksgiving Day parade in living color for the very first time. We had relatives from Arkansas on their way, and as a special treat, I vaguely remember my mom cutting up a hunk of cheddar or some American slices, or maybe even squirting some Easy Cheese on Ritz Crackers to serve up on this festive tray. I still use that JC Penney tray this day, so when I saw its potential partner at the flea market, I was so mesmerized that it's no wonder the guy thought I was high. I finally came to my senses to negotiate a price -- I think $1 -- and dreamily drifted away, most likely with a dopey grin glued on my face.